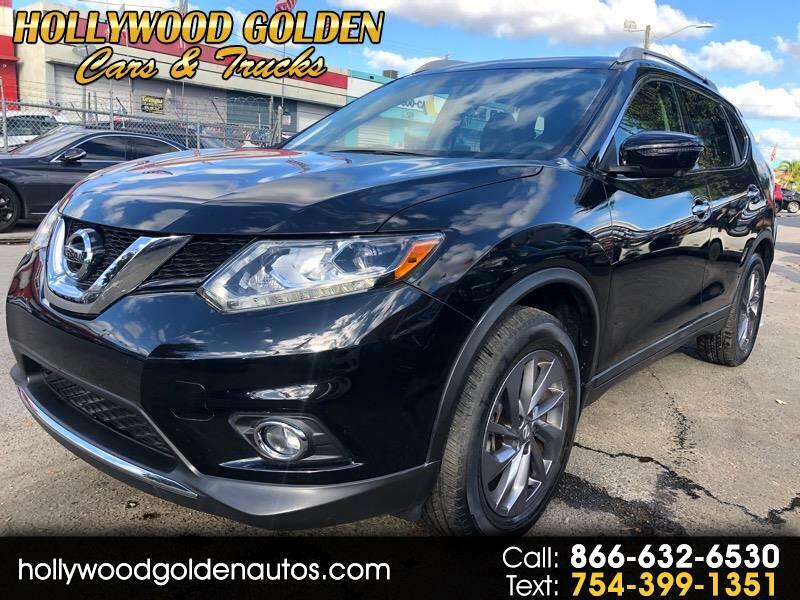 2016 Nissan Rogue SL Premium SUV Auto Only 13k Miles 4 Door Full Power Backup Camera Sunroof Leather only 13k Miles LOW LOW Miles !! Runs GREAT !!! All the Tech Loaded up Alloys Sunroof and much more!! Runs GREAT !! ***** No Credit Check Financing HERE !!! Several to Choose From !! Runs GREAT !!! All the Tech Loaded up Alloys + more runs great ****-*- FREE WARRANTY ***** LOW Miles . ! !Â ***** Listed Finance prices are reduced based on $ 3000 Down Payment plus taxes. ********** Listed Finance Prices do not include Title fee registration tag fees or Taxes. ********* Several other vehicle to choose from starting at $ 1500 down and up *****In great condition everything works perfect !! All Vehicles Come with a WARRANTY ! **** On Sale here at Hollywood Golden Cars and Trucks**** Any questions on this ONE Call me Direct at 954-362-4684 All Vehicles are guaranteed. -Â -- Nice n Clean inside and out Runs GREAT !! For more pictues and information on this and all of our other vehicles check out all of our inventory online @ hollywoodgoldenautos.com********* BUY HERE PAY HERE *****No Credit Check************** Hollywood Golden Cars and Trucks ************Check out all our inventory online hollywoodgoldenautos.comÂ 954-362-4684 Se Habla EspanolÂ We accept VISA M/C and ATM DEBIT CardsÂ ** WE OFFER NO CREDIT CHECK FINANCING CALL US AT 866-632-6530 **EVERYBODY drives. Every body approved with Required Down Payment !! !Â WE MAKE IT EASY!!! NO CREDIT CHECKS!NO PROOF OF INCOME!! NO SS NEEDEDSe ofrece FINANCIAMENTO SIN CHEQUEO DE CREDITO **Â NO NECESSITA NUMERO DE SOCIAL PARA FINANCIAL AQUI **Â Todos Manejan sin chequeo de credito** Trabajamos con nuestros clientes** Lo Hacemos facil de manejar ** LOS FINANCIAMOS AQUI !! ****** Visit us online at www.hollywoodgoldenautos.com to see more pictures of this vehicle To schedule your test drive. Call me at 954-362-4684 office ********** ********************************************************** **************** Hollywood Golden Cars and Trucks ********************* *********************************************************** 5820-A Funston Street Hollywood FL 33023 Check out all our inventory online *** www.hollywoodgoldenautos.com ****** 1-866-632-6530 Se Habla Espanol *** We accept VISA M/C and ATM DEBIT Cards *** ** WE OFFER NO CREDIT CHECK FINANCING CALL US AT 866-632-6530 ** *** Call us today at 1-866-632-6530 for any information needed on any of our vehicles listed for sale. Call or stop by and see it at 5820-A Funston Street in Hollywood FL 33023 *** WE MAKE IT EASY! !EVERYONE APPROVED WITH REQUIRED DOWN PAYMENT! NO CREDIT CHECKS! *** NO PROOF OF INCOME!! NO SS NEEDED *** Se ofrece FINANCIAMENTO SIN CHEQUEO DE CREDITO ** NO NECESSITA NUMERO DE SOCIAL PARA FINANCIAL AQUI ** Todos Manejan con deposito de entrada requirido ** Trabajamos con nuestros clientes ** Lo Hacemos facil de manejar ** LOS FINANCIAMOS AQUI ! !